The current political turmoil in the Middle East is getting a lot of attention, and for good reason. The rioting and potential for a major regime change in Egypt, a country with the region's largest population and a tremendous amount of power, may have many ramifications: some which will likely be seen relatively quickly, and others that may develop over a slightly longer period (esp. as other countries watch on). Just weeks ago the Tunisian president fled to Saudi Arabia during the night while people took to the streets. In essence, the government has been overthrown. The Lebanese regime of Saad Hariri was also recently overthrown, and now a pro-Hezbollah, anti-Israel Prime Minister is in power. People are also in the streets of Algeria, Yemen, Jordan and Syria to protest at their own levels of poverty, unemployment and lack of personal freedom. Consequently, a major regional shift in power and ideology is ripe to take place if events play out in favor of an organization called The Muslim Brotherhood, a radical Islamist group. Unlike Al Qaida, "the brotherhood" operates more covertly and arguably more strategically. That makes it all the more dangerous as it wields its power and exerts a well-organized opposition to governments in the Middle East. The uprising in Egypt is providing a very opportune time for the brotherhood to come onto the scene more overtly and take over the nation of Egypt, and then influence other forces within the entire region. If a major regime change takes place in Egypt, Egypt's 32-year peace treaty with Israel will very likely be one of the first items to be on the chopping block. Like all organizations based on the Muslim religion, they do not want the Jews in Israel. If the Muslim Brotherhood could control the powerful nation of Egypt, then Iran, Syria, Hamas, and Hezbollah would also be prone to aligning with one another, which would put Israel at grave risk of being attacked. We need only look back to the Six Day War in 1967 to see a historical precedence. Adding to the mix of international intrigue is that the U.S. currently has (had) a cordial relationship with Egypt. In fact, in an ironic twist, the U.S. has supplied billions of dollars worth of military hardware to Egypt over the past several years, in attempts to help stabilize the region and keep the likes of Iran, Russia, Iraq, Syria, Lebanon, and the terrorist organizations of Hezbollah and Hamas in check. Now that very objective could backfire very quickly. Previously I mentioned Al Qaeda, which is the more obvious Islamic threat. If the Muslim Brotherhood and Al Qaeda could put aside their differences, their mutual desire to wage Jihad (war) against Christians and Jews would be the obvious result. Hamas, the Palestinian branch of the Muslim Brotherhood, has the primary goal to impose Islamic sharia law upon the world. Controlling Egypt would provide it just the platform it would need to accomplish that. As Christians watch these events and consider them in light of Bible prophecy, we recognize that ultimately God is in complete control. Thus, the events that play out will be according to His plans. For the past few years prophecy experts have been taking a close look at Psalm 83, which describes events that could almost be pulled straight out of today’s headlines. That is, the nations that share borders with Israel continue to line up against her, lobbing missiles and instigating terroristic attacks against Israeli citizens. These nations are Lebanon, Syria, Jordan, Saudi Arabia, and Egypt. Hezbollah, Hamas, and other terrorist entities are also essentially part of the list. My good friend Bill Salus, author of Isralestine, has some insight about this topic that I believe is very important. 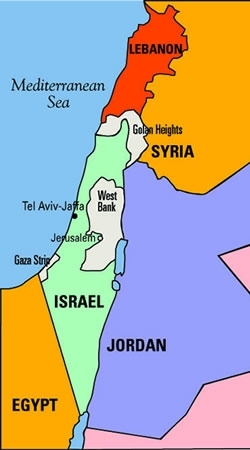 He notes that Ezekiel 38 prophesies that Israel will be dwelling securely and that when we read about the war of Gog and Magog, there is no mention of the nations that immediately border Israel. It is intriguing that Israel’s most observable opponents over the last 60 years since the restoration of the nation are not enlisted in the Ezekiel 38 nine member consortia of nations. This has puzzled scholars a lot recently. These are the very nations that border Israel through which the Russian invasion would be trespassing into to get into Israel to invade. So, why are they not listed? And, of course, what we are referring to are Lebanon, Syria, Jordan, Saudi Arabia, Egypt, and what has evolved out of those entities are Hezbollah, Hamas, Palestinians, and other terrorist entities could be included in that list. WHERE IS THE U.S. IN END-TIMES BIBLE PROPHECY? Thus, at the very least the United States will not be on the side of Israel. That also has to take place because of the way in which God once again will permit Israel to be victorious, which would not be as miraculous if a superpower were on Israel’s side. The reason why the U.S. will be “against Israel” is not clearly known. Many eschatologists theorize that the Rapture will have taken the Christians (and thus, the driving force behind why the U.S. is “Jewish-friendly”) away. Indeed, such an event would thrust the entire world into a chaotic situation and open the need for a so-called “savior” to offer peace and stability to a world in turmoil; hence, it would provide an opportune time for the Antichrist to enter the scene. There are many other theories that, when especially combined with the rapture theory, easily explain how the U.S. will be absent from end-times prophecy. I explain them all in my book, Pray That You May Escape; but for the lack of space and due to the focus of this article, I will not include them all here. Suffice it to say, no matter how it happens, we know it will happen because God's Word says so. The times in which we live are very interesting. We know that it will become increasingly worse (a time of great trouble). Praise God, it's all part of His plan. For Christians, God also has another plan, referred to as our "blessed hope" in Titus 2:11-14. I'd like to leave you with the words of Jesus in Luke 21:36, “Be always on the watch, and pray that you may be able to escape all that is about to happen, and that you may be able to stand before the Son of Man”. Maranatha! "The birthpangs of a new Middle East"